Located in the mountains of southwestern Virginia, Meadow Creek Dairy is a small family farm dedicated to sustainable agriculture. Using a system called intensive grazing management, Meadow Creek ensures that the herd is enjoying fresh pasture from Spring through Fall. This system of seasonal rotational grazing makes for cheese that truly reflects the local terroir cultivated on the farm. Grayson is one of the best American cheeses, a perennial crowd-pleaser. 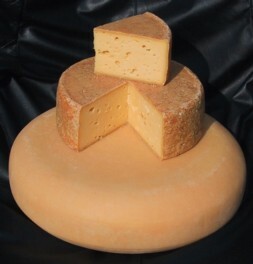 The ruddy washed-rind enshrouds a gorgeous golden yellow semi-soft pâte, which is incredibly deep in flavor, simultaneously fruity and buttery, with hints of the local grasses and legumes that the cows feed on. This cheese is proof that happy cows make happy cheese. Set me up with some Grayson, a glass of Albariño, and CD of Bill Monroe, and I'll be in heaven. Cheese by Hand has a great write-up on the farm if you crave more information.